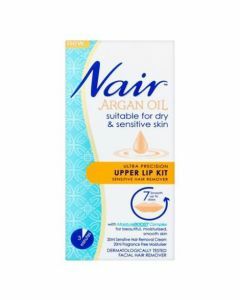 Remove body hair with ease with the Argan Oil infused Nair Bikini Brush On Hair Removal Cream. A gentle, effective & ultra precise bikini brush-on hair removal cream. Enriched with a combination of delicate Argan Oil & a MoistureBoost Complex, this hydrating formula will leave your skin feeling soft & smooth. Always read the enclosed leaflet for instructions & precautions.